Kiwis sort of have a track record of being a little crazy, and white water rapids seem to bring out the worst of us as seen here and here, however could I really call myself a travel blogger if I didn’t jump on every opportunity to try out as many of the activities New Zealand has to offer? So when my partner mistakenly tells me I would NOT be gate crashing a boys day out before his best friend got married (keyword here mistakenly), of course I jumped on board for white water rafting in Rotorua, before heading to Cambridge for the gorgeous wedding of our two friends. I’m going to say it right away, I have not a single regret and thoroughly enjoyed the escapade, however it did leave me a little shaken. I’m not the biggest adrenaline-junkie around but I do love giving things a shot. I also have this strange habit of going gung-ho into these sorts of activities feeling no fear, but then once I actually experience them for what they are (e.g. a little bit dangerous) I’m left questioning my sanity. I have to admit, this was definitely one of those times. 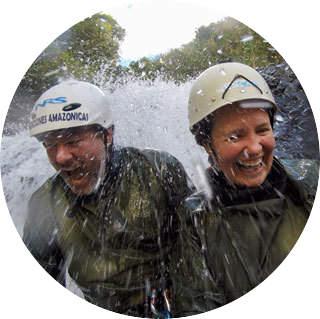 We booked with Kaituna Cascades, a really fun group of guys, who look like they truly love their job. We signed up for their highest grade of rafting, a choice I thoroughly recommend. It’s not overly exerting, it’s not particularly dangerous and the views are beautiful. The trip takes you down (up?) the Kaituna river, through ‘historical’ rusty old power plants, beautiful inlets of water, cliff sides covered in classic Kiwi foliage and sends you careering through some stunning green water. But let’s be real here – you’re not going white water rafting for a peaceful row through scenic vistas! If you’re reading this, it’s likely you’re the kind of person looking for the next opportunity to be pushed around, thrown about, tipped upside down, and in one unfortunate instance, smashed pelvis-first into a rock. For my first experience white water rafting, I would say this was definitely a good fit. While it has a pretty significant waterfall drop at one point (OK, it might just be the largest commercially rafted waterfall in the world! ), as white water goes this was pretty easy-going and a good starting point for anyone who, like me, might be afraid of getting the technique wrong. When it comes down to it, there’s really nothing to it but to listen to your instructor and do as much shouting as you can – and you will shout! But wait – what was that I said about a smashed pelvis??? Don’t worry, no bones were broken, just a serious bruise and that’s definitely avoidable. While the guys at Kaituna were awesome and made sure they did the utmost to ensure we all had the best time that we could, I still ended up getting hurt. Which I suppose is what you risk – or even hope for – when doing something like white water rafting. There were two spots on the trip where they said we could get out and swim; the first being a lovely gorge-like area of the river, and the second being um… right before a waterfall. So that first one sounds great, right?! And it was. It was like being swirled around in a giant pool – a pool surrounded by nature and people laughing from exhilaration. That last one, though? Um, not so great. We all jumped at the opportunity to dive back in the water after the fun we had in the gorge! Just quietly, I think the instructor was keen to get us in too, as he didn’t manage to get us to flip the boat going down the big waterfall. In retrospect, perhaps this wasn’t the most strategic place to get out of the raft though? We all found ourselves careering towards the waterfall and despite the instructors’ best efforts to call us back to the boat, our swimming was no match for the current. In the end, one of us went down the waterfall by himself – a fairly scary experience I would say – while my partner and I were instructed to hold onto the side of the boat as it went down. Now, I’m not an expert – as I said this was my first time rafting – but holding onto a boat as it goes wherever it pleases down a rocky waterfall? It was less than ideal. Not only did we have the full force of the current, but also the full weight of the boat on top of us. Both Michael and I were slammed against the rocks and then dragged across them. Honestly, the experience shook me quite a bit and from there I was kind of keen to get out of the water. Regardless of this, I thoroughly recommend the Kaituna Cascades guys and I absolutely recommend trying out white water rafting. I’d just encourage everyone to be a little bit more wary of when you get out of the boat. Oh, and please, PLEASE don’t hold onto the side of a raft as it slams its way down a waterfall. Off to New Zealand? On the hunt for adventure? Pin this post! As this was a last minute plan, I didn’t have my GoPro on me but I would like to give a big shout out to Jacob Laukaitis who went down the river with us and got some awesome footage. He hasn’t put the clips into a Youtube video but when he does you can find them here, or see a bunch of his awesome travel shots on his Instagram account. This entry was posted in Adventure, New Zealand and tagged North Island.